Nick Beilby worked on the East Coast Main Line from the age of 19. Here he recounts his experience as a trainee draughtsman based at Selby and York. The first clip covers his first years where he was seconded to Selby to learn the ropes. The second clip includes tales of a rather unorthodox railway driving test and working within earshot of the Selby swing bridge. 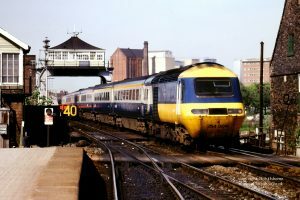 Nick also describes the variety of locomotives seen on the line – you might want to look at the LNER Encylopedia archive to see some of the locomotives he refers to. The third clip has more on the Selby swing bridge and an account of a fire in the ash ballast that closed the East Coast mainline for several hours. The final clip has Nick signing off. Thanks to him and to Jonathan Stockwell of the Derwent Valley Light Railway for the interview.